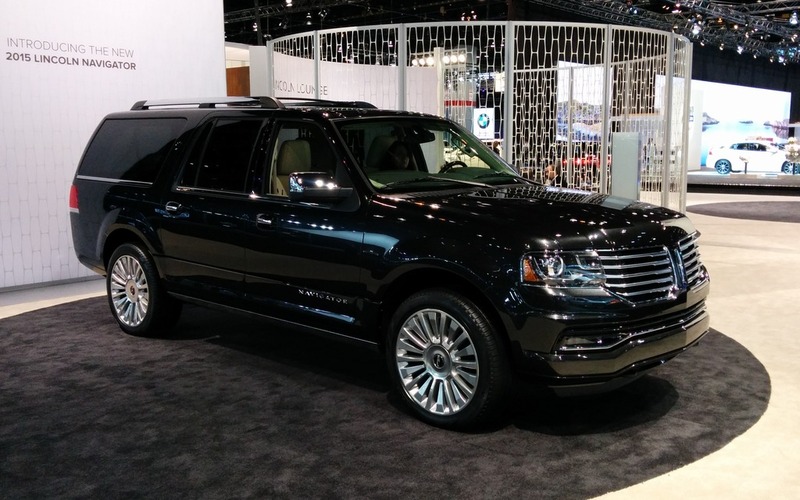 Rather than getting drowned out by all the other unveils during the North American International Autoshow, Lincoln chose to unveil the 2015 Navigator facelift online, a week later. Replacing the older 5.4-litre 310 horsepower Triton V8, the 2015 Navigator sports a 3.5L V6 EcoBoost which increases the horsepower to 370 while improving torque output by 65 to 430 lb-ft. The engine is matted to a six-speed transmission. Also: The 2012 Lincoln Navigator: Not extinct... not yet, anyway. Also: 2012 Lincoln Navigator: Any bigger and it would bite you! Lincoln’s “Continuously Controlled Damping” adaptive suspension will be standard with normal, sport and comfort modes. The Navigator will also have the MyLoncoln Touch infotainment system, blind spot monitoring, push-start and keyless entry. Production of the 2015 Navigator is scheduled to begin late this summer at the Kentucky Truck Plant in Louisville, Ky., and vehicles are due in Lincoln showrooms in early fall. You'll be able to see it live during its debut at the Chicago Auto Show in February. JAN 23, 2014 | DEARBORN, MICH. The Lincoln Motor Company introduces the new 2015 Navigator, offering a fresh interpretation of a classic vehicle that has long defined the full-size luxury sport utility segment. At the Chicago Auto Show on Feb. 6, the public will get its first look at a new Navigator that takes on a changed presence for the 2015 model year. Exterior design changes are accentuated by the reintroduction of Lincoln’s iconic split-wing grille. Interior enhancements include luxurious leather and additional customer-focused technologies. The more refined appearance complements enhanced power and hauling capabilities that Navigator customers demand. The sleeker front end includes a newly designed hood, and the reimagined back end features a power up/down tailgate. On both ends, the vehicle wears jewel-like light-emitting diode (LED) lights, as well as high-intensity discharge (HID) adaptive headlamps with LED accents. Navigator comes standard with 20-inch, machined aluminum wheels, while Reserve Package vehicles are equipped with 22-inch, polished aluminum wheels. Reserve Package Navigators also offer optional chrome-accented running boards. As with current-generation models, the 2015 Navigator will be available in standard-length (207.4 inches) and extended-length (222.3 inches) versions. Navigator comes standard with the new Lincoln steering wheel, introduced on the recently revealed MKC premium small utility. The Wollsdorf leather-wrapped, wood-trimmed wheel features a thicker grip and softer touch for a more dynamic driving experience. Designed to seat up to eight people, Navigator offers buyers second-row options that include two captain’s chairs, with or without a center console, or a fold-flat bench. Due in part to Navigator’s patented independent rear suspension, which allows for true fold-flat, PowerFold® third-row seats, extended-length and standard wheelbase models are projected to deliver segment-leading cargo volume. Extended-length models provide 128.2 cubic feet of cargo space behind the first row, 86.3 cubic feet of cargo space behind the second row, and 42.6 cubic feet of cargo space behind the third row; standard wheelbase models deliver 103.3 cubic feet of cargo space behind the first row, 54.4 cubic feet behind the second row, and 18.1 cubic feet behind the third row. Replacing the 5.4-liter V8 that has powered Navigator for years is a more powerful and fuel-efficient 3.5-liter EcoBoost engine. The twin turbocharged, direct injection engine is projected to deliver at least 370 horsepower and 430 lb.-ft. of torque, according to preliminary test data. Final numbers will be available closer to production. The 3.5-liter EcoBoost is also projected to deliver best-in-class towing. Navigator features a six-speed automatic transmission with Lincoln’s SelectShift, which allows the driver to manually control gears if desired. The vehicle is available in both four-wheel-drive and rear-wheel-drive configurations. The available Control Trac Four-Wheel-Drive system enhances traction on slippery surfaces, helps improve handling on dry roads and enables off-road capability. Helping make this the best-handling Navigator ever is the addition of standard electric power-assisted steering. This allows for more consistent and precise control of the vehicle through a range of speeds while simultaneously making it easier to maneuver at low speeds, and in particular making it easier to park. The Lincoln Drive Control option adds Lincoln’s Continuously Controlled Damping (CCD), a suspension system that monitors multiple vehicle sensors and road conditions every two milliseconds and adjusts the suspension needs accordingly. CCD also provides a smoother and improved ride – best-ever for Navigator – and allows the driver to customize the ride of the vehicle by selecting one of three different control modes: Normal, Sport and Comfort. Navigator also offers driver-friendly Hill Start/Descent Assist. When parked on a hill with a grade of five degrees or more, the vehicle remains stationary for up to two seconds after the driver releases the brake pedal. Standard-equipped Navigators will continue to offer Nivomat®, a load-leveling system that automatically raises a loaded rear end to optimum ride height for improved handling. The mechanical leveling system helps reduce uneven wear on front and rear tires and helps maintain better vehicle aerodynamics. Illuminated “welcome mats” beneath both front doors greet Navigator owners when they press the “unlock” button on the key fob. A passive entry system allows owners to enter without using a key. The system senses when the key fob is in range of the door and allows for keyless access via a door-mounted button. Inside, a push-button start allows for keyless engine ignition. The latest SYNC® with MyLincoln Touch™ driver connectivity system is standard. The system allows drivers to use voice-activated or touch screen controls to make phone calls, play music, use the navigation system or set cabin temperature controls. The system includes 4.2-inch LCD displays in the instrument cluster, an 8-inch touch screen in the center stack and traditional knob controls for easy operation. The available Blind Spot Information System (BLIS®) signals when another vehicle is detected in an adjacent lane behind either rear wheel. Standard for 2015, Navigator also introduces a new rearview camera, which displays a color image on the 8-inch touch screen for help when driving in reverse. Navigator was wildly popular the moment it hit the streets in the late 1990s, and spent more than a decade as one of the top-selling vehicles in the segment. Featuring seating for up to eight passengers, luxury cues typically reserved for sedans and cargo space and towing capacity to haul virtually anything, Navigator set the full-size luxury SUV standard. It was an immediate success, accounting for 41 percent of in-segment sales by the 2000 model year. Aiming to recapture that glory, the 2015 Navigator offers nearly two dozen upgrades from the current generation. Production of the 2015 Navigator is scheduled to begin late this summer at the Kentucky Truck Plant in Louisville, Ky., and vehicles are due in Lincoln showrooms in early fall. Test Drives The 2012 Lincoln Navigator: Not extinct... not yet, anyway. Test Drives 2012 Lincoln Navigator: Any bigger and it would bite you! News How Much is the 2015 Lincoln Navigator Worth?